Callum Knox on What’s it all about? Norlan Jacobs on Hello, New York! Jenny on Hello, New York! The nights have officially drawn in: time for more cozy reading? Spring is not quite upon us here at the LabLit nerve center – winter is having one last bash and we are all hunkered down waiting for its final chill to pass. I’ve been quite busy, with the science day job intruding regularly into my evenings and weekends, but have still managed to keep up with Fiction Lab. We had a great discussion of Richard Powers’ latest novel The Overstory this past Monday at the Royal Institution, with the usual range of rapture-to-quibbles in evidence. I really liked it, being a pretty passionate tree-hugger myself, but others recoiled against the author’s attempt to make more of trees than meets the eye. I won’t spoil it except to say that there’s lots of interesting science, and one particularly convincing scientist character. It’s well worth the effort – even if you aren’t a Powers fanatic like I am. What The Overstory most reminds me of is one of his earlier lab lit classics, Galatea 2.2 – but far more sweeping…and maybe slightly somewhat (but not completely) less melancholy. Heavy snow is in the forecast here at the LabLit nerve centre, but we’ve laid down the grit and have plenty of provisions. In the event of being snowed in, there’s certainly plenty to read. We have two fantastic books coming up at our Fiction Lab book club at London’s Royal Institution: Give Me Your Hand by Megan Abbott, and The Overstory by Richard Powers, both of which look amazing (though the latter has a daunting width). And if you’re too busy for novels, we’ve just published a short story from our regular contributor Becky Nesbit called “Inyeon”, about a chance encounter at an airport lost and found – and have a few more great stories in the pipeline. Most of us are now trickling back to work, and – if you’re anything like me – coming to terms with the fact that only a small fraction of our intended reading-for-pleasure actually got read. The pile on my bedside (pictured above) is still very much of an alarming width, and that doesn’t include the ones queued up on my Kindle either. The astute among you may note that only one science-y novel appears: Richard Powers’ latest, which I am looking forward to, although the sheer weight is putting me off a bit and he’s nowhere near the beginning of the queue. 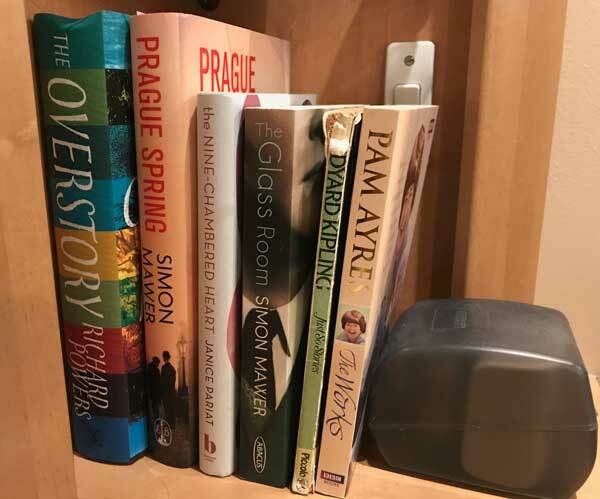 Simon Mawer’s The Glass Room is next on my list, but before I could even start it, Simon gifted me with another (his latest, Prague Spring) when we did a literary event together in Oxford last November. I’d better get a move on before he finishes the next one! The Nine Chambered Heart was a kind Christmas present from Dom Stiles, our chief “lab lit sniffer”: it’s not science-y either, but looks intriguing and I can’t wait to dive in. The Pam Ayre anthology was a recent birthday gift from my husband, who say’s it’s essential for understanding the British psyche, and as for the Kipling, he’s been reading it aloud to my son to the delight of all three of us. We’ve got lots of great things in store for this year, so keep reading, and keep nominating books for the Lab Lit List! The title is more wishful thinking on my part, but a girl can dream. November is always a busy time for the various LabLit volunteers, but I am pleased to report that our LabLit List curator, Åsa, has finished scrutinizing and processing the massive pile of nominations that have accumulated over the past year. It was a big job, and we’re really grateful! It’s just down now to the team here at the LabLit nerve center to get it published. I can’t wait to see it all live on screen – it’s going to be amazing. Today we’ve published another of our “Imaginary Cats” instalments by our very talented regular contributor Becky Nesbit: The golden ticket, a short story about GMO issues tearing a family apart. Do take a look! This past week in London, the Fiction Lab book club at the Royal Institution in London had a very special guest, author Stephanie Bretherton, who came along to discuss her debut novel Bone Lines. This intriguing story is divided between two characters: an ancient female from the Paleolithic era, and the modern-day scientist who is studying her fossil remains. It’s always so wonderful when an author comes along to give us the inside scoop on writing their novel, and a truly engaging and insightful discussion resulted. We talked about whether scientist characters could be made more palatable by giving them a mystical side – I think the consensus was that (especially) for a non-scientist reader, this could indeed be a good strategy. We also discussed our favorite topic, the best ways to present scientific information in a work of fiction without treating the readers to a prose infodump. Bretherton had several interesting strategies we haven’t encountered before, including having her scientist protagonist take part in a TV documentary, and also writing letters to her hero, Charles Darwin. Next month we’re going to get to grips with some early lab lit: Ann Veronica by H.G. Welles, which is about a feminist scientist in a man’s world*. If only the author were still alive to pop by Fiction Lab to tell us more! As autumn gathers around the LabLit.com nerve center, I can only lament how few books-for-pleasure I managed to get through during my vacation. But it’s always the way – sometimes the novels I pack never even manage to leave the suitcase. We’ve been a little quiet over the summer period, but content should start picking up again soon in its usual “back to school” kind of way. As always, if you have anything to contribute to the site, just drop us a line on editorial(at)lablit.com. I promise we don’t bite. And if you think our response is taking too long, just give us a friendly prod. We are all volunteers with busy day jobs! In the past week or so we’ve put up two new pieces – a story about the grant-reviewing process from our regular fiction contributor João Ramalho-Santos, entitled ‘Panel‘, and today’s offering: a neat little essay about how fiction adds value to understanding the scientific experience, from another regular contributor, Pippa Goldschmidt. I can also report that a year’s worth of new nominations for the Lab Lit List has officially hit the desk of our List editor, Åsa Karlström, and should be ready for publication soon! (No pressure, Åsa.) It’s early days, but I’m fairly confident in saying that this may be our biggest upgrade yet, reflecting a growing popularity for writers wanting to deal with scientist characters. Long may it continue. 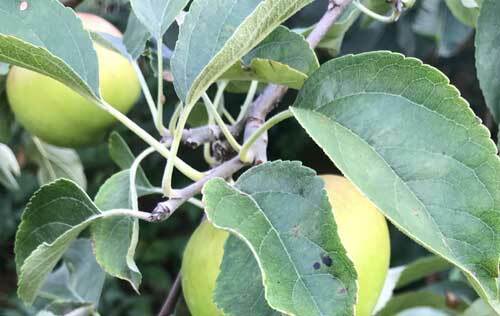 It’s the heart of summer now here in England, and we’re in the midst of a protracted heatwave. Sunshine always makes me want sit in the shade and get lost in a good book. Life is as busy as ever in the Lab Lit nerve center. But after recovering from a flurry of literary engagements, including Fiction Lab’s Ten-Year Anniversary event at London’s Royal Institution, I’ve had the chance to do a bit of beach reading myself – including a guilty pleasure which I’ll review in due course for the main site. In the meantime, if you’re wondering what to bring on holiday, I recommend a number of recent lab lit novels in an interview on Living Lab Radio with the fine folks at WCAI National Public Radio, in what’s becoming a semi-regular geeky spot. Take a listen. I’ve also got a new novel out myself: Cat Zero, which has everything you need for a great escapist read with science at its heart. But don’t just take my word for it: Matthew Reisz, writing for The Times Higher, deemed it “highly entertaining” and said that “it shines light on the backbiting and tensions of lab life as an unlikely team of scientists work to save the cats of Kent from a mysterious virus”. He also wonders, “who could stop themselves reading to the end to discover how it turns out?”. Who indeed? Go on, you know you want to. 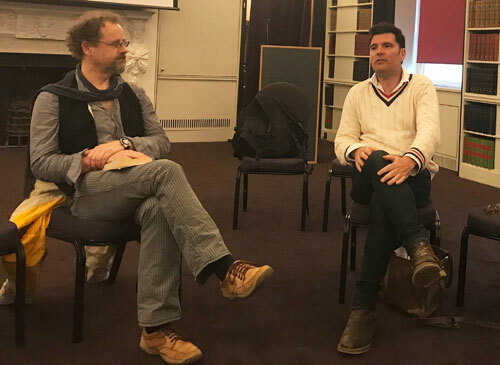 The LabLiterati had a wonderful time this past Monday when author Edward Docx (no relation to the file extension) was our special guest at the Royal Institution’s Fiction Lab. His novel, The Devil’s Garden, is a smart and literary lab lit thriller featuring a group of scientists studying ants in the Amazon who get caught in a deadly conflict among the military, the oil companies, the indigenous tribes and the cocaine producers. Highly recommended. Ed was a lovely and engaging guest who was interested in our feedback and kept the conversation moving with lively descriptions about his own times in the Amazon and the inspirations for the story. He rather charmingly brought along two copies of his latest novel Let Go My Hand to give away to the people he sensed were “the least enthusiastic” about The Devil’s Garden. He even joined us down the pub afterwards and bought us two rounds of bar snacks – what better way to endear himself? We are pleased to publish the latest instalment in “The League of Imaginary Cats”, our series examining famous scientific discoveries through the lens of fiction. In A rose by any other name, Deputy Editor Richard P. Grant writes about a mysterious discrepancy surrounding the development of the famous anticoagulant, heparin, which remains a mystery to this day. And if you’re new to the Cats series, you can use the navigation tools at the top right to check out the entire series. It’s been a bitter cold winter here in London, complete with various nasty illnesses decimating the LabLit nerve center. 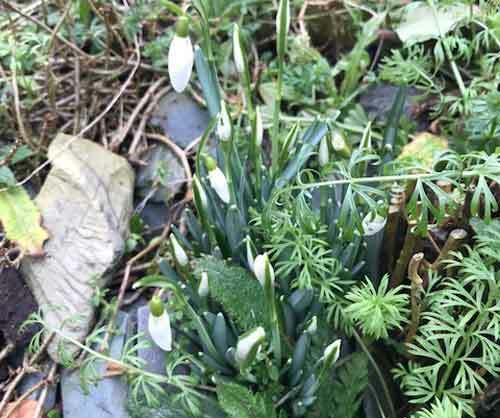 But I’m happy to report that spring finally seems to be on its way – even though the thermometer still doesn’t reflect it. I also had eye surgery in the new year, which put a stop to most of my reading endeavors. I did trial out an Audible eBook, and while I enjoyed the experience, I decided that it was just too expensive to carry on. So until my eyes get a bit better, I’m going to be living vicariously through the discussions at the London Fiction Lab book club..
Our most recent piece up at LabLit comes from our regular contributor Anne Burke, who’s been inspired by an interview with Margaret Atwood to muse about the difference between science fiction and speculative fiction that happens to come true some time in the future. Finally, I’m pleased to report that we’re gearing up for a major upgrade of the LabLit List, going live in March. In the meantime, I wish you all a cosy, warm and happy ending to this long, cruel, flu-ridden winter! I’d love to hear what you’re reading to survive in good cheer. Our fiction series The League of Imaginary Cats continues with An attic recluse, a fine flash fiction from Helen-Frances Pilkington – with a rather abrupt ending. As the cold and grey January trundles on here in our neck of the woods, I hope that everyone is escaping in novels and stories and looking forward to the coming spring.